Is it a good idea to continue practicing Yoga while you’re recovering from Tennis Elbow? And are there any poses that could exacerbate or even cause Tennis (or Golfer’s Elbow) if done incorrectly? 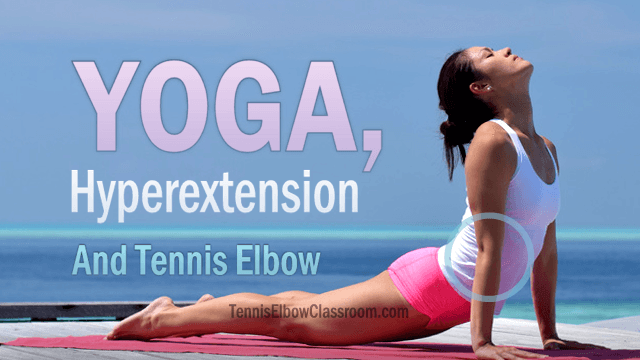 I was motivated to write this article by a question from a Tennis Elbow Classroom Member on the advisability of certain Yoga poses while still in the process of recovering from Tennis Elbow. Does your elbow tend to extend further than 180 degrees (into ‘Hyperextension’) in the following Yoga poses – and in the images below? If you have this tendency (which comes from an inherent, often hereditary Ligament Laxity – or “looseness”) it’s possible to damage your elbow joint by overstretching already lax ligaments. Unfortunately, this tends to happen cumulatively – sneaking up on you gradually with minimal symptoms to warn you in the early stages. 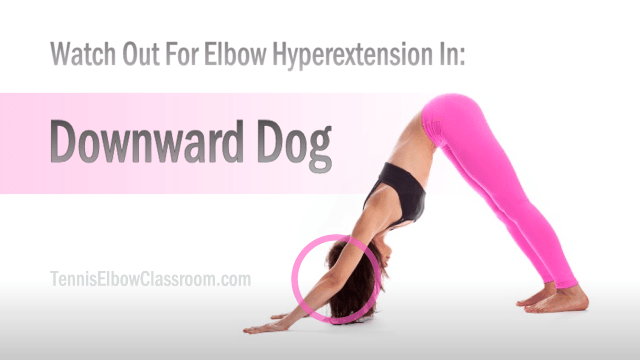 Don’t Hyperextend Your Elbow In These Poses – Especially If You Have Tennis Elbow! Yoga Teacher Diane Bruni has written the most comprehensive and scientific article I’ve seen so far on the subject of ‘Hypermobility’ – especially as it relates to Yoga. In the video below, Michaelle Edwards, creator of the YogAlign Method, discusses the dangers of ‘Ligament Laxity’ compounded by Hyperextension in certain Yoga poses, like Downward Dog. And that it’s not wise to stretch the shoulder that far (into extreme flexion) and in the process put more weight than ideal on the upper-body joints of the shoulders, elbows and wrists. In October of 2010, Dr. Michelle Carlson, an Orthopedist, published an article where she described how, over the course of several years, she had seen an increase in patients with hand or wrist pain brought on or aggravated by yoga practice. One of the biggest risks appears to be for women with hypermobile hip joints, who do a lot of Yoga. He related how a Yoga Teacher / Author in Hawaii, Michaelle Edwards, of YogAlign – (see video on wrist and elbow injuries, above) contacted him about a little-known hip injury risk to women. Up to this point, Yoga-related injuries in men were apparently more visible – resulting in more serious acute injuries like fractures and dislocations and subsequent trips to the E.R. Avoid Hyperextending your Elbow in the Cobra Yoga pose if you have Tennis Elbow. In her article she reveals the fact that she was already in chronic pain in her wrists when she began practicing due to her “distorted” elbows, and how her Yoga Teacher pointed this out to her in one of her first classes. And she states emphatically that to overload your joints this way by taking them to their extreme end range of motion is “a recipe for injury” because of the potential wear and tear on the cartilage. Watch your elbow very carefully in Side Plank Pose – The weight of your entire upper body is all on one elbow and wrist in this position! Is this an absolute, “use extreme caution!” NEVER-ever-do-it rule, however?… Well, apparently, not necessarily! In the following article the author gives us a very nuanced, thoughtful alternative view, calling into question the idea that hyperextension is always wrong. And reminds us of the principle that a certain about of stress/load on the body (tension and compression) is healthy and necessary to build or maintain strength and health overall. If you can see the image below, the woman is extending her elbow past 180 degrees (which is considered “normal” full extension) to an extreme, 195 degrees. And, underneath, the man has his elbow at about 20 degrees short of full extension. Once again, my biggest concern is for those of you with Tennis Elbow who are also Yoga enthusiasts. I’m not saying “Don’t do Yoga while you have Tennis Elbow” – You may find Yoga to be helpful in your recovery! Just be careful, and be aware of this elbow Hyperextension risk – Especially if you’re female or you know you have outright joint Hypermobility or a tendency toward Ligament Laxity! Thanks, Wenzday. I wouldn’t worry about either of these poses, since they’re not upper-body load-bearing. Locust / Salabhasana looks like it could require some upper-extremity effort – but I think it might be fine, since the wrists stay in a neutral position and it’s more Wrist Flexor involved.